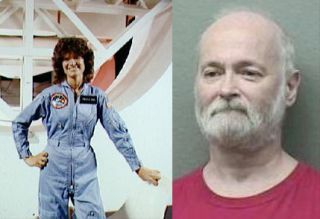 Calvin Dale Smith, right, is accused of stealing NASA property including a training suit worn by Sally Ride, left, the 1st American woman in space. A lightblue flight suit worn by Sally Ride as she trained to be the firstAmerican woman in space is among several NASA artifacts that CalvinDale Smith of Houston has been charged with stealing, according todocuments filed by space agency agents in federal court. In addition to Ride's suit, which includes her name tag and themission patch for her 1983 historic flight aboard space shuttleChallenger, Smith, 56, was indicted by a grand jury for knowinglyreceiving, concealing and retaining parts from a shuttle airlock, a safetytether assembly, a twice flown in space Omega watch and an astronautflight jacket, among other items of government property totaling nearly$10,000 in value. Now in federal custody and with representation by a public defender, Smithpleaded not guilty Thursday, May 27 in a Houston, Texas federal courtroom. NASA's Office of the Inspector General (OIG) agents were led to the flightsuit and the other artifacts by Smith's wife, court papers show. Smith's wife found and reported the allegedly stolen space equipmentin May 2009 as Smith was nearing his release after being jailedfor domestic violence involving a firearm. She was contacted by Smith's mother who was seeking to gather his personalitems including a suitcase. Asked to identify which suitcase, Smith'smother reportedly replied, "you know, the suitcase," accordingto court documents. Per his wife, Smith was once employed by Boeing's Flight Processing Group,which at the time maintained astronaut equipment, including their flightsuits, for NASA. Not wanting to be in possession of what she suspected was stolenNASA property, Smith's wife reached out to a friend who in turn contactedthe FBI, which then contacted NASA. Following her original discovery and surrender of the suit inthe suitcase, Smith's wife found and reported additional items shebelieved was NASA property. Among the other items were what theNASA-prepared documents identify as an extended-range crew member (ERCM)safety tether assembly and three airlock parts, which are described as"similar to couplers." Also recovered was an Omega Speedmaster watch that during asubsequent inquiry with the Swiss watchmaker's own museum was identifiedby its serial number as having been delivered to NASA in 1978 andused on two shuttle missions. Smith's wife provided all the suspected stolen property toNASA investigators. According to Smith's family, who spoke with Houston CBS affiliate KHOU-TV,Smith had a "long-time crush" on Sally Ride and that's whyhe allegedly stole her suit. Smith also reportedly tried to sell thesuit to the Smithsonian, which rejected his offer. The Smithsonian's National Air and Space Museum owns and displaysthe two-piece flight suit that Ride wore on her STS-7 missiononboard Challenger in 1983. The jacket and pants are exhibited in theWashington, DC-institution's "MovingBeyond Earth" gallery, which opened late last year. The "replica" suit that the Smiths saw while touring SpaceCenter Houston is described by its curator, Paul Spana, as a being anauthentic training suit of Ride's. As with all shuttle astronauts,Ride was issued multiple flight suits to wear while training. The one-piece flight suit that Ride wore while in orbitmay never be identified. It is not listed as in the Smithsonian'scollection nor does NASA identify it among its inventory. According to Louis Parker, exhibits manager for Johnson Space Center, thecompany which took over the astronaut equipment contract from Boeing, UnitedSpace Alliance, released many of the same-era flight suits to museumsseveral years ago but before doing so, removed all the identificationlabels such that the suits could not be traced back to specific astronautsor missions. The suit that Smith allegedly stole is described as havingits tags and patches still attached, which allowed for its identificationas one of Sally Ride's training suits. Court documents show that a trial date for Smith has been set for July 12.If convicted, he faces a $250,000 fine and up to ten years in federal prison.